Half Acre Haunting Pattern is available today in honor of Halloween. Half Acre Haunting Pattern is available in 22-ounce bottles at the brewery today, along with a matching long sleeve t-shirt. Availability: 22oz Bottles. Brewery Release. Half Acre Double Daisy Cutter, the bigger, boozier version of the brewery’s pale ale returns today for the only time this year. As the name suggests, Half Acre Double Daisy Cutter is a bigger version of the brewery’s Daisy Cutter with fewer boundaries. It carries all the big citrus and grassy notes of the year-round pale ale, but with more hops and an amplified malt presence. Usually brewed quarterly, Double Daisy Cutter is a Chicago favorite. A monster version of the original Daisy Cutter Pale Ale. A heftier grain bill amps up the weight and double dry hopping insures there’s enough grit to recede your gums. Half Acre Double Daisy Cutter was first brewed in 2010. Since then, it appears a few times a year. Available in 16-ounce 4-pack cans. Half Acre Vallejo IPA, the brewery’s spring and summer seasonal returns April 1st. The beer draws its name from talented artist, Boris Vallejo. “Fresh pops of lemon and dried white grapes” is how Half Acre describes this India pale ale. Perfect for warmer temperatures. An uncontested brewery favorite, Vallejo is soaking wet with beach driven pine and citrus, finishing as bitter and persistent as the sand in your shorts. Regardless of how you choose to consume it, this beer’s sole intent is to thrash its way into your good times. Half Acre Vallejo IPA is available in 16 ounce cans and draft once again, starting Friday, March 31st. Half Acre Tuna Extra Pale Ale is the next year-round can by the Chicago, Illinois based brewery. This beer went by ‘Golden Tuna’ in the taproom in the past. As Half Acre puts it – “We all took the short cut and now Tuna lives.” The pale ale features Mosaic and Centennial hops, and is big on citrus and passionfruit. It’s a perpetually gassed up 3-wheeler, churned and ready to take you wherever you wanna go. Cans of Half Acre Tuna Extra Pale Ale will be available at the brewery’s Lincoln Avenue shop starting Friday, March 3rd. Half Acre Chocolate Camaro is back in drive on January 13th. A must have for dessert beer fans. Slow burn, deeply etched coco surrounds a medium build, pseudo-mod toast machine. Fire power restrained by responsible intention. Excessive muscle slow rolling past the local fuzz. Bring your milk money, it’s lunch time. 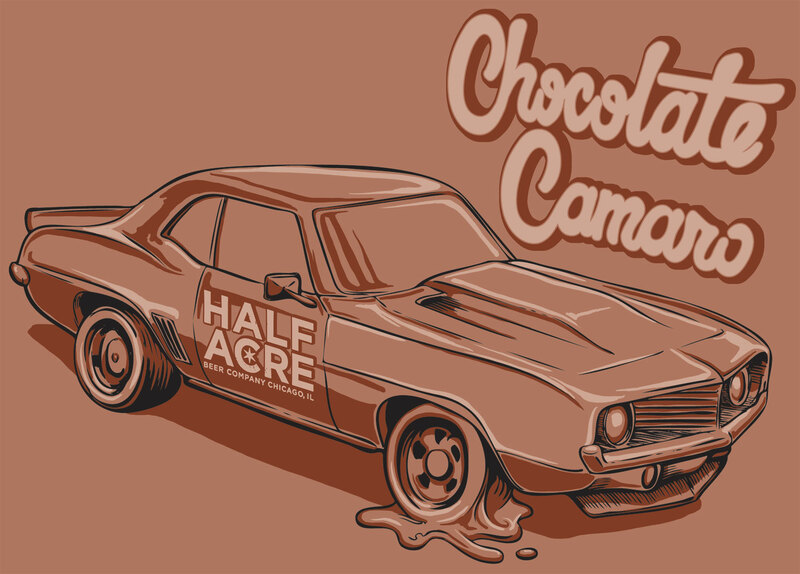 Half Acre Chocolate Camaro is a 22 ounce bottle release, and draft. Growler fills are available at the brewery. Availability: 22oz Bombers, Draft. Growler fills. Half Acre Big Hugs Salted Chocolate Espresso will join the brewery’s lineup alongside the annual Big Hugs release. 2016 marks the 8th release of Big Hugs, an imperial stout brewed with Dark Matter Coffee. As an added treat, the Chicago based brewery will release an edition with a little twist – aka Big Hugs Salted Chocolate Espresso. 22 ounce bottles will be available at the brewery on December 11th, 2016. $14 per bottle. Availability: 22oz Bottles, Draft. Brewery only. Half Acre Big Hugs with Coffee and Vanilla will join the brewery’s lineup alongside the annual Big Hugs release. 2016 marks the 8th release of Big Hugs, an imperial stout brewed with Dark Matter Coffee. As an added treat, the Chicago based brewery will release an edition with extra vanilla – aka Half Acre Big Hugs with Coffee and Vanilla.